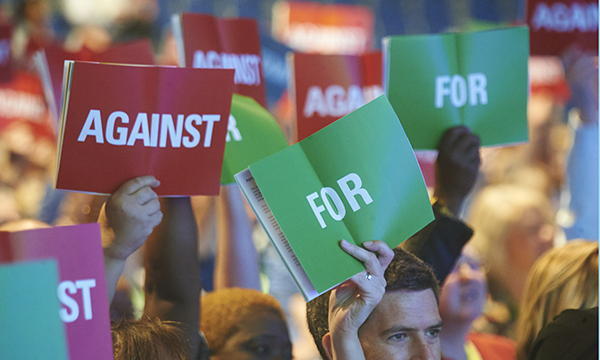 Demands for ‘credible’ action on the recruitment and retention of nurses, research into mental health staffing levels and waiving health fees for overseas nurses will be voted on at this year’s RCN Congress. But the topics chosen for the agenda at May’s annual conference in Belfast omits calls to debate rejoining the International Council of Nurses. Top of the agenda will be a call to instruct the RCN’s ruling council to publicly condemn government policies such as removing bursaries for nursing students and reducing funding for continuing professional development. Congress is an opportunity for members to shape the work of the college in the year ahead by voting on resolutions and engaging in debates, fringe meetings and workshops. Attendees will also be asked to vote on a motion calling for the waiving of the immigration health surcharge fee – which it was recently announced will double to £400 later this year – for overseas nurses on work permits and their dependents. The RCN Mental Health Forum will propose research is carried out into therapeutic staffing levels in mental health services, while the Devon branch will demand the government is lobbied to reverse funding cuts to public health nursing. A call for the RCN Council to develop and promote a strategy to recruit more men into the nursing profession. How to challenge the ‘draconian’ practice of staff not being allowed to carry water bottles in clinical areas. Lobbying the government to decriminalise cannabis for medicinal use in the UK. However, a proposal by the RCN’s We Are Global Nurses group to include a debate on the college rejoining the International Council of Nurses – which Congress voted to leave in 2013 – was rejected. A spokesperson for the RCN said: ‘There are always a huge number of submissions, and the committee considers each item on its merits. Members put together an agenda that will be of interest to the greatest number of attendees. People who have proposed unsuccessful items will be disappointed, but members attending congress will have the opportunity to attend a large fringe event with the ICN. The exact date and order of the resolutions is yet to be decided. It will be revealed when the full agenda is published. Congress also includes matters for discussion, which are items considered as important for nurses to air their views on but without the need for a formal vote to decide a course of action. Technology features heavily in debates on whether body worn cameras would improve staff and patient safety, and the role of robotics in health and social care. Delegates will also discuss suicide awareness within the nursing profession, the issue of role substitution across the healthcare system and the implication for patients of low uptake of flu vaccinations by nurses. Congress runs from Saturday 12 May to Wednesday 16 May at Belfast Waterfront conference centre.